Promoting your content has clear short-term benefits — like attracting new readers, social shares, and comments. But did you know it’s also a critical part of your search engine optimization strategy? Even the best on-page SEO efforts don’t work as well if no one links to your site, so one of your biggest jobs is spreading the word out about your content. You’ve got to attract incoming links to rank well in search engines, and no one is going to link to you if they don’t know you exist. In this post, we’ll talk about why content promotion is important for SEO and how to create your own content promotion system. Why is content promotion important for SEO? After you publish a piece of content, your next goal is to get people to engage with that content. When people like your content, they’ll share it on social media and link to it from their sites, which sends search engines a “thumbs-up” signal. That signal says, “This is high-quality content,” and you want as many of those votes as possible. People share content from sites they know and trust, and they often visit those sites from their favorite social media platforms and their inboxes — so that’s exactly where you want to show up. While I wouldn’t recommend emailing bloggers and editors you don’t already have relationships with, don’t forget about touching base with your online network when you publish extra special content. For instance, I’ve developed a relationship with writing and creativity coach Cynthia Morris over the years. Now if I publish a piece of content that is a particularly good resource for her audience, I can show the article to Cynthia and ask her to share it via social media if she likes it. If you already have a connection with someone, reaching out via email with a note about your content may help them find useful information to share with their audience. When you promote your posts to your fans and followers on the social media sites you use, complement your text with compelling images. Need to know the optimal sizes for your social media images? Check out this frequently updated guide from Sprout Social. It’s okay to share a link to the same piece of content multiple times on a particular social platform. Just remember to vary updates that link to the same piece of content, so they don’t look too repetitive. For example, some updates should have different text and you can experiment with adding or omitting images. Try a scheduling tool like the one in the Rainmaker Platform to make this process easier and more efficient. Guest posting helps you establish connections with influencers in your field, and it can lead to new website visitors and email subscribers when it’s done correctly. It’s also (potentially) a great content promotion tactic. But before you include a link to your own content, get approval from your host and always honor the site’s rules about links. If you’re allowed, link to a piece of your cornerstone content in the text of your guest post or in your author bio. To maximize engagement with a link to your site, clearly explain what people will find when they arrive on your site and how the content will benefit them. For more information, read Henneke’s post, Unleash a Surge of Email Subscribers from Your Guest Posts with This Simple Landing Page Strategy. To breathe new life into older content and help it reach a wider audience, repurpose it into different formats. Every time you publish a repurposed version of the original interview, you can link to the original podcast episode. It’s not enough to just publish and then sit back with your feet on your desk — you’ve got to spread the word about your content and give people easy ways to access and consume it. But don’t forget about on-page optimization. On-page and off-page SEO work together to help you rank higher in search engines. 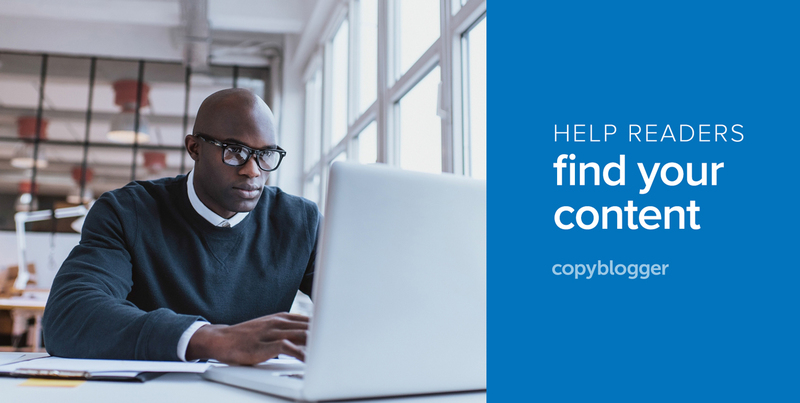 Discover five on-page elements you need to make your content easily digestible for search engines in Copyblogger’s free ebook, How to Create Compelling Content that Ranks Well in Search Engines. What’s your favorite way to promote your content online? Share it with us in the comments below! Thanks for sharing. Repurposing is a great way to avoid writer’s block and not have to recreate the wheel. Content can be broken down into multiple posts or a deeper dive can be taken to create fresh takeaways. When combined across multiple platforms it can create a much larger impact. I’m an SEO guy.. and I don’t stop reading. Your article got my brain refreshed and added to my knowledge. Generating the content is not enough, you should promote it to boost the SEO. More shares lead to better SEO. Follow the 80/20 rule of blog promotion. Spread your content on the social media and get more hits. Writing the guest posts is a great idea. I am on it. Thank you for the great post! Repurposing the content really got me thinking. Great point! Repurpose your content – it’s really a great idea. Agree with everything except the 3rd point – Writing Guest posts. Guest post can help you get exposure only in certain niches. I’ve tried guest posting but the results weren’t what I was hoping for and the overall ROI isn’t that good considering you need to write a solid article and that for someone else’s blog. I suggest using the content yourself. Just my $0.02. While every situation is different, guest posting can be a very powerful way to get your content in front of a larger audience. I’m not sure which niches or topics it wouldn’t work for — if you have an example, I’m all ears. It’s not a quick ROI technique, but it does work well to expand your audience, get your ideas out there, build your authority, and, yes, if the work is good and you’re publishing on quality sites, to show the search engines that you know your stuff. Your site seems to be more of a tech news site than one that’s publishing original ideas or establishing your authority — so I can see how guest posting might not have been an immediate home run for you. “Guest posting helps you establish connections with influencers in your field, and it can lead to new website visitors and email subscribers when it’s done correctly.” This was very helpful and informative. I have been trying to implement a guest posting section on my site and have been making guest posts on other site. Thank for these precious tips. I was underestimating Facebook presence because I always thought that social media does not help in SEO. But now, after going through many useful resources (including this article), I will start using social media as one of my top tools to increase engagement and exposure. Also, thanks for the Sprout Social document, that will help me in many projects. Guest posting is an invaluable strategy with different payoffs which can be short or long term. I don’t do it often enough but I did reach out to a site this year and wrote a guest post for them. They let me know that it was their most shared content on their blog, invited me to guest post any time, asked to quote me alongside other well-known influencers for an upcoming piece, invited me to be in a closed group of content creators of theirs to share ideas with one another and offered me to use their services for free as a part of that exclusive community. I did not expect any of this from guest posting so it just goes to show that you never know what a guest post might yield you besides exposure to a new/wider audience. I’ve found that I can’t repurpose my content without improving it in the process, so that’s another benefit to repurposing my content.